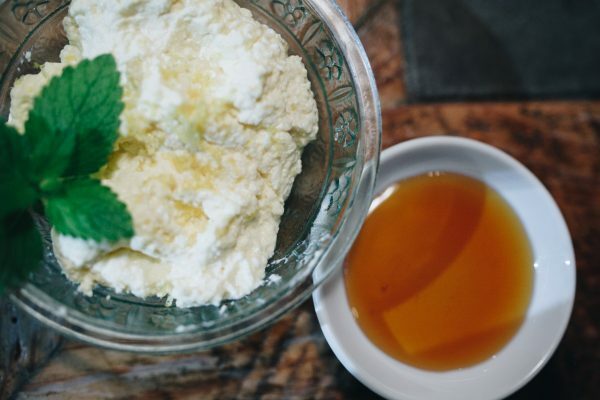 This recipe comes from Smitten Kitchen and I find it is my favorite recipe for ricotta cheese. It is so easy to make and because I use raw milk the flavor is unbelievable. If you can get raw milk I highly recommend it. Raw milk has all the enzymes and healthy fats that normally get taken out in the pasteurization process. They help your body digest the milk cultures and usually won’t cause tummy trouble, even for the lactose intolerant. I’m a big believer in raw milk mostly because it makes this ricotta so ridiculously good! There are so many yummy ways to eat it, we have it as a topping for crostini, with lemon zest, rosemary and honey, dolloped on a pizza or pasta and sometimes just as a topping with jam on your morning toast. There will be more recipes to follow using this delicious cheese. It’s one of those recipes that I think about and crave and get so happy when I can make it! This recipe makes about 1 cup of ricotta. 1. Pour the milk, cream and salt into a 3-quart nonreactive saucepan. Attach a candy or deep-fry thermometer. 2. Heat the milk to 190°F, stirring it occasionally to keep it from scorching on the bottom. 3. Remove from heat and add the lemon juice, then stir it once or twice, gently and slowly. Let the pot sit undisturbed for 5 minutes. 4. Line a colander with a few layers of cheesecloth and place it over a large bowl (to catch the whey). 5. Pour the curds and whey into the colander and let the curds strain for at least an hour. At an hour, you’ll have a tender, spreadable ricotta. At two hours, it will be spreadable but firmer, almost like cream cheese. Note: It will firm as it cools, so do not judge its final texture by what you have in your cheesecloth. 6. The whey can then be saved to use in homemade sauerkraut or can be discarded. 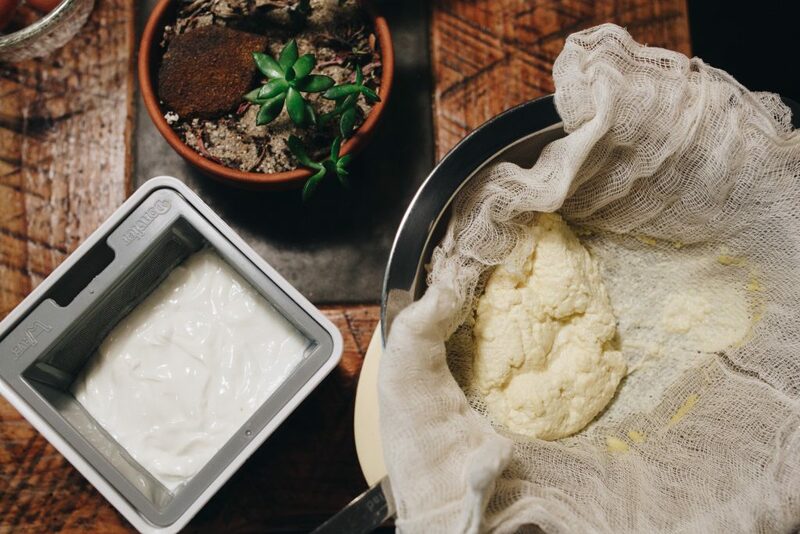 Eat the ricotta right away or transfer it to an airtight container and refrigerate until ready to use. If you can stop yourself and your family from eating it right out of the bowl, I like to serve it within a few hours. It is so deliciously rich and creamy there are a ton of possibilities for how to serve it. I will share one of my favorite combinations this week! Pour the milk, cream and salt into a 3-quart nonreactive saucepan. Attach a candy or deep-fry thermometer. Heat the milk to 190°F, stirring it occasionally to keep it from scorching on the bottom. Remove from heat and add the lemon juice, then stir it once or twice, gently and slowly. Let the pot sit undisturbed for 5 minutes. Line a colander with a few layers of cheesecloth and place it over a large bowl (to catch the whey). Pour the curds and whey into the colander and let the curds strain for at least an hour. At an hour, you’ll have a tender, spreadable ricotta. At two hours, it will be spreadable but firmer, almost like cream cheese. Note: It will firm as it cools, so do not judge its final texture by what you have in your cheesecloth. The whey can then be saved to use in homemade sauerkraut or can be discarded. 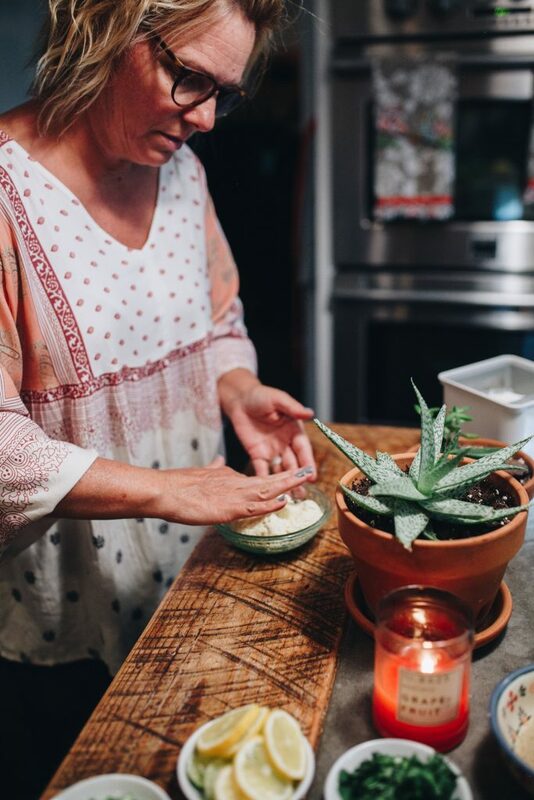 Eat the ricotta right away or transfer it to an airtight container and refrigerate until ready to use.